In 1934, delays in the design and production of the Panzer III and Panzer IV tanks were becoming apparent. Designs for a stopgap tank were solicited from Krupp, MAN, Henschel, and Daimler-Benz. The final design was based on the Panzer I, but larger and with a turret mounting a 20 mm anti-tank gun. Production began in 1935, but it took another eighteen months for the first combat-ready tank to be delivered. The Panzer II was the main battle tank of the German Panzer divisions beginning with the invasion of France, until it was replaced by the Panzer III and IV in 1940/41. Afterwards, it was used to great effect as a reconnaissance tank. The Panzer II was tested in the Spanish Civil War and used in the German campaigns in Poland, France, Holland, Denmark, Norway, North Africa and Russia. After being removed from front-line duty, it was used for training, on secondary fronts and for patrolling occupied Europe. The Panzer II A, B, and C had 14 mm of slightly sloped homogenous steel armor on the sides, front, and back, with 10 mm of armor on the top and bottom. This armor proved to be ineffective against anything heavier than a machine gun, so starting with the D model, the front armor was increased to 30 mm. The Model F had 35 mm front armour and 20 mm side armor. Most tank versions of the Panzer II were armed with a 2 cm KwK 30 L/55 cannon. Some later versions employed the 2 cm KwK 38 L/55 which was similar. This cannon was based on the 2 cm FlaK 30 anti-aircraft gun, and was capable of firing at a rate of 280 rounds per minute, a very high rate for a tank. The Panzer II also had a 7.92 mm Maschinengewehr 34 machine gun mounted coaxially with the main gun. The 2 cm cannon proved to be ineffective against many Allied tanks, and experiments were made towards replacing it with a 37 mm cannon, but nothing came of this. Prototypes were built with a 50 mm tank gun, but by then the Panzer II had outlived its usefulness as a tank regardless of armament. Greater success was had by replacing the standard armor-piercing explosive ammunition with a tungsten cored solid ammunition, but due to material shortages this ammunition was in chronically short supply. Later development into a self-propelled gun carriage saw the mounting of a 5 cm PaK 38 antitank gun, but this was seen as insufficient for the time, and the larger 7.62 cm PaK 36(r) was installed as an effective stop-gap. The main production antitank version was fitted with a 7.5 cm PaK 40 which was very effective. Artillery mounting began with a few 15 cm sIG 33 heavy infantry guns, but most effective was the 10.5 cm leFH 18, for which the Panzer II chassis became the primary carriage for the war. Most of these versions retained a pintle mounted 7.92 mm MG34 machine gun for defense against infantry and air attack. Continuing the conventional design of the Ausf. 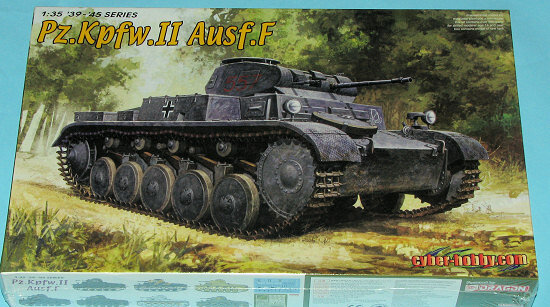 C, the Ausf. F was designed as a reconnaissance tank and served in the same role as the earlier models. The hull was redesigned with a flat 35 mm plate on its front, and armor of the superstructure and turret were built up to 30 mm on the front with 15 mm to the sides and rear. There was some minor alteration of the suspension and a new commander's copula as well. Weight was increased to 9.5 tons. 524 were built from March 1941 to December 1942 as the final major tank version of the Panzer II series. Dragon continues to offer interesting and updated kits. This particular one is marketed under their Cyber-Hobby name and includes all of the upgrades that were common to the Ausf F variant. That includes new 2 cm cannon, new turret, which includes internal details. A new MG 34 machine gun with cradle as well as a full interior makes this a very complete kit. 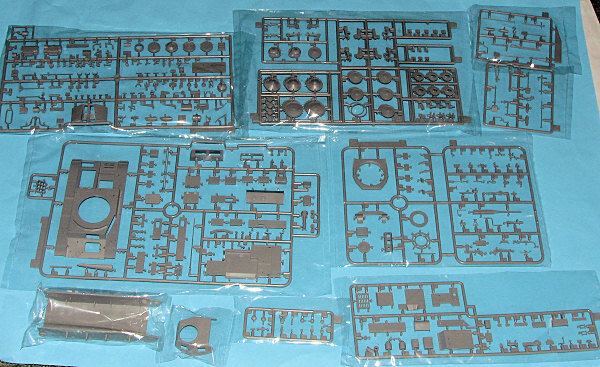 As expected, there are a lot of sprues and also quite a few unused parts. 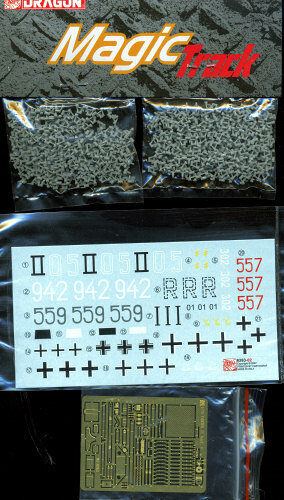 I was surprised to see so many clear sprues (not shown). A photo etch fret is also part and parcel of the kit, many of the parts being used for hold downs and other detail bits and pieces. 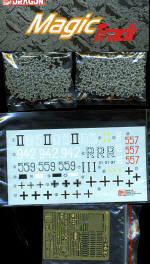 A full set of Magic Tracks is also included in the kit and should really enhance the look of your kit when done. The suspension is nicely done and very well detailed. Thanks to this being a small tank, not a lot of road wheels, though they do have rubber edges on them that will need to be painted. There are also a number of optional bits and those are all ably called out in the instructions. These instructions are superbly drawn, as one expects from Dragon, and while they look complex, they are really not and provide a number of additional drawings to make sure you get the right bits in the right place. The full interior shows that there just wasn't a whole lot of room in these early tanks and it must have been quite noisy as well. Unlike many tank kits, the engineering on this one is such that you don't have to deal with the tracks until nearly the last step. Makes painting and weathering these much easier. There are markings included for seven different tanks, all with a interesting camouflage schemes, so there is no lack of options in this regard. The decals are well printed and should work well with a bit of help from setting solutions. I'm the sort of modeler who likes their tanks small. Not sure why, but I do. I'd rather build something like this than a King Tiger. Well, this one has all you could ever ask from a kit including superb tracks and a full interior, something you don't always get with armor kits. It is one that I know you will enjoy building.